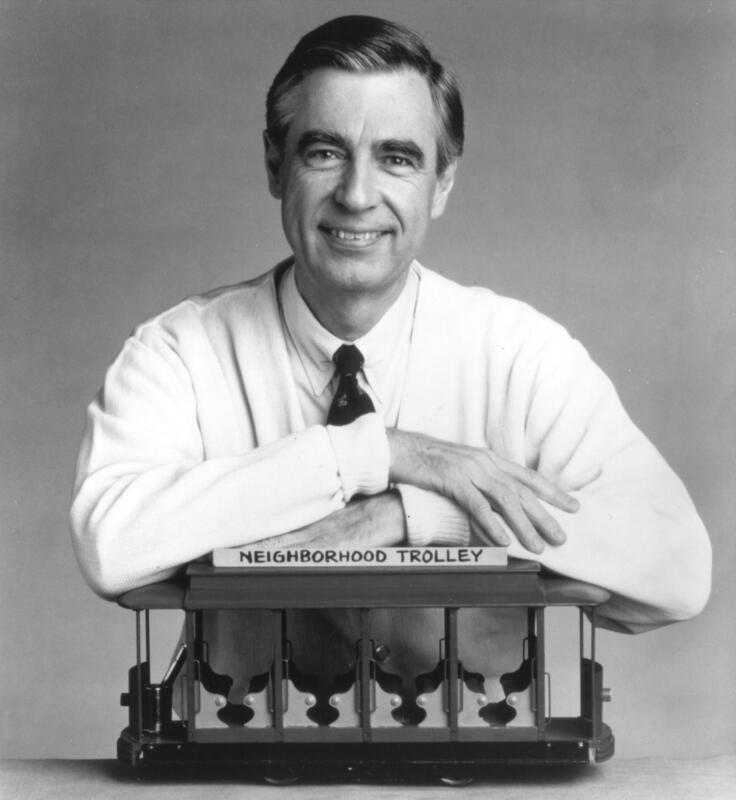 Fred Rogers of Mister Rogers' Neighborhood in the 1980s. Editor's note on Aug. 8, 2018: This piece has been substantially updated from a version published in 2014. A solemn little boy with a bowl haircut is telling Mr. Rogers that his pet got hit by a car. More precisely, he's confiding this to Daniel Striped Tiger, the hand puppet that, Rogers' wife, Joanne, says, "pretty much was Fred." "That's scary," says Daniel/Fred. He asks for a hug. The boy hugs the tiger. Not a dry eye in the house. That scene is from Won't You Be My Neighbor, the hit documentary airing across the country with a 99 percent rating from critics on Rotten Tomatoes. At first, such a film might seem superfluous. Why make a movie about a man who appeared as himself in hundreds of highly rated television episodes? Someone as familiar to millions of adults as a childhood friend? Not because it reveals some shocking hidden side to the TV host, husband, father, Presbyterian minister, puppeteer, composer, organist, best-selling author and noted cardigan aficionado. He wasn't gay, says his good friend and co-star Francois Clemmons, who is. He wasn't a Navy SEAL, either — not sure how that rumor got started. What makes Morgan Neville's biographical documentary so necessary, in fact, is that it shows Rogers was exactly what he appeared to be. Someone who devoted his life to taking seriously and responding to the emotions of children. In a word: to love. Yes, Mister Rogers' Neighborhood was slow. It was repetitive. This was thoroughly, developmentally appropriate; Rogers was informed by his coursework at the University of Pittsburgh, by pediatricians like Dr. Benjamin Spock and Dr. T. Berry Brazelton, and his mentor, child psychologist Margaret B. McFarland. "It's when someone is killed, in a surprising way." The date was June 7, 1968. Robert F. Kennedy had been assassinated just days before. Fred Rogers and his team addressed the incident directly in an episode aimed both at children and adults. It explored how to share your own feelings and answer children's questions and common concerns. It also showed how children process scary events through play. It's hard to think of any children's media today, let alone a TV show in its first season, that so directly, and quickly, responds to the news. Yet there is far from a shortage of traumatic events today, and parents and teachers need help talking about them. It's a topic we've covered often on NPR Ed. NPR's Susan Stamberg appears in the documentary, saying she liked to invite Rogers on the radio to reassure parents and children. In 1979, for example, she had him on to talk about the Iran hostage crisis. He often brought a message that's become almost a meme today: When the news is scary, "look for the helpers." Mister Rogers' Neighborhood focused on one audience: preschoolers. And for good reason. Today, increasing evidence points to the importance of early childhood education. Its impact can be felt decades down the road — in adults' education levels, incomes, even health. Mr. Rogers was in it for the love. "The whole idea," he told CNN in 2003, "is to look at the television camera and present as much love as you possibly could to a person who might feel that he or she needs it." But he wasn't all sweetness and light. The shows repeatedly took on emotions like anger and sadness, too. He wanted children to learn that "feelings are mentionable and manageable." I may get mad and even feel violent, went one song, but "I can stop when I want to." His shows, books and songs were carefully designed to give kids the tools to deal with what he called "the inner drama of childhood" — from sibling rivalry to loneliness, anger and edgier topics like gender expression (as in the song "Everybody's Fancy"). Today, the science has caught up. Research tells us social and emotional skills, including self-regulation, and being able to recognize emotions, are as important to success as academic achievement. Fred Rogers' attitude toward electronic media perfectly mirrored the love/hate relationship many of us have with technology today. "I got into television because I hated it so," he told CNN in 2001. Over decades, he reached millions of households and won every award in the business. His position was simple: TV is here to stay, and its ubiquity and power must be harnessed to help our youngest and most vulnerable. "In a young child's mind, parents probably condone what's on the television, just like they choose what's in the refrigerator or on the stove," he once said in an interview. "That's why we who make television for children must be especially careful." Yet his position was ambiguous, for even as he condemned most television he became one of the century's most embraced TV personalities. The film portrays him as basically single-handedly saving public media with his heartfelt testimony to a Senate panel in 1969. Today, the debate about both the quality and quantity of children's media use is hotter than ever. Four in 10 children under 8 have their own handheld device, and they spent nearly an hour a day with them, according to one 2017 study. Leaving aside the question of dosage, how much of that content could, or should, parents condone? Public television still exists, and there are highly rated apps and games from commercial providers. But streaming video like YouTube has flooded the market for kids' media. It gives children instant access to millions of hours of content, a lot of which is probably ill-suited, and some of which doesn't even seem to be made by human hands. Which leads to the question: Could a show like Mister Rogers' Neighborhood succeed today? Would 2018's children sit still to watch a man take off his loafers and lace up his sneakers, and to watch a little trolley trundle off into the Neighborhood of Make-Believe? There are some gently paced shows for preschoolers, although nothing quite as slow as the original Neighborhood. Very few are live-action, except for good old Sesame Street. In content? "Fred Rogers pretty much invented [social and emotional learning] as a topic for a show," says Linda Simensky, the vice president of children's programming at PBS. In 2013, they debuted Daniel Tiger's Neighborhood, an animated reboot of the Mister Rogers universe. The show is streamed millions of times a month, mostly on mobile devices. Each episode uses a song to teach a strategy for dealing with an emotion, including fear, anger and frustration. "The whole curriculum is based on Fred's research and teaching," Simensky says. Daniel Tiger tackles potty training, allergies, and Mom going to work. But, now in its fourth season, it hasn't taken on politics or current events. It's hard to imagine any TV show for a broad audience of the youngest children responding to, say, Black Lives Matter the way Mr. Rogers took on racial segregation. (There are always more options in picture books.) In 1969, when swimming pools had become racial battlegrounds, Rogers filmed himself soaking his feet on a hot summer day with his friend Officer Clemmons. The good news is that Mr. Rogers left us enough episodes that there is one to fit almost anything that might come up in the news today. In one episode from the very first week of the show, the hand-puppet King Friday XIII opposes change. So he decides to build a wall around his kingdom. Some of the other puppets and people float balloons over the wall with messages like LOVE and PEACEFUL COEXISTENCE, warming the king's heart. The wall comes down.